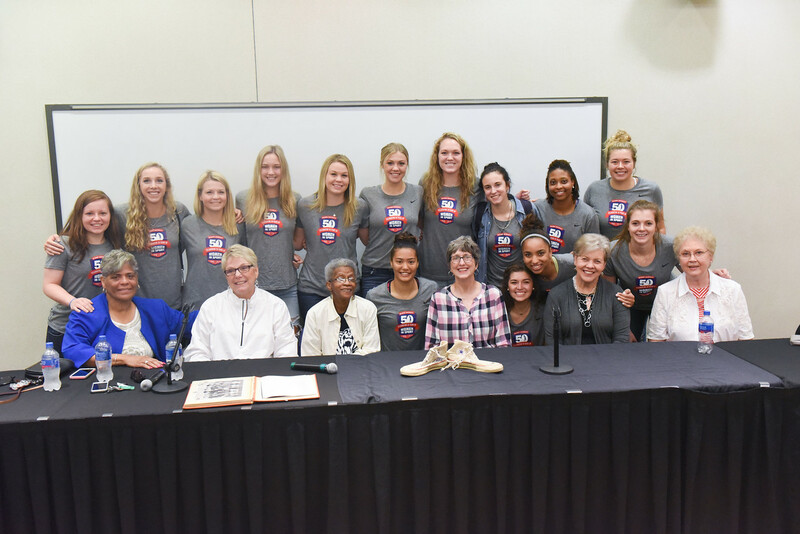 The women of Belmont’s first women’s sports team returned to campus last week to discuss their experiences with students following their attendance at the 2017 Belmont Athletics Hall of Fame induction ceremony where they were honored as the University’s third-ever Legendary Team. The panel included Mattie Spicer Yokley, Alfreta Peterson Johnson, Cinda Haddon, Sherry Chandler-Cunningham, Dianna Burton Lewis and Coach Betty Wiseman. The women, who played on Belmont’s first women’s basketball team in 1968, recounted their adventures and offered advice to the current team. Betty Wiseman, who founded the women’s sports program and taught at Belmont from 1966-2006, described what it was like to be a group of women in sports in 1968. As a trailblazer in women’s sports and the founder of one of the first women’s sports programs in the Southeast region, her team was given the smallest budget and the last practice slot in the gym. She recalled the girls trudging to late-night practices, which prohibited them from wearing shorts and instead allowed only long sweatpants. “We were behind on everything else, but we had an opportunity,” she said.